With support, education, and work-life balance, we can develop a new generation of nurse managers. Nurse managers are experiencing significant changes to their roles with expanded scope of responsibilities. 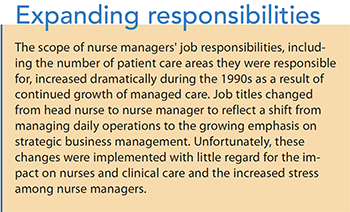 Rapid expansion of responsibilities with little support can lead to stress and turnover of nurse managers. To retain nurse managers, nurse executive leaders should focus on three strategies: balance workload with support, invest in competency development, and promote work-life harmony. NURSE MANAGERS have long been recognized for their influence on job satisfaction and retention of clinical nurses as well as their support of quality patient outcomes. So it shouldn’t be surprising that the shift to value-based purchasing has highlighted nurse managers’ importance in achieving high levels of patient satisfaction, patient safety, and financial performance. However, increased scrutiny of nurse managers’ performance might increase their stress and reduce their job satisfaction. It also may make recruiting new nurse managers more difficult. We know a great deal about job satisfaction, engagement, and retention of clinical nurses, but we know much less about nurse managers. What we do know is that they’re generally satisfied and engaged, but many report that they plan to leave their current positions within 3 to 5 years. Their reasons for leaving vary: Some are looking for career advancement opportunities, others report stress and burnout, and many are coming up on retirement age. Whatever the reason, this turnover will create a leadership vacuum that may negatively impact individual organizations and the profession as a whole. Recent changes to hospital reimbursement models have resulted in a sharper focus on patient care quality and outcomes, and shorter lengths of stay have dramatically increased patient acuity. To meet these demands, the nurse manager role now includes an emphasis on data-driven performance monitoring and decision-making, which means experience with technology has become more prominent in nurse managers’ job descriptions. The wide variation of experience and knowledge among nurse managers may result in technology being viewed as a help for some and a challenge for others. Changes in responsibilities without adequate support can increase stress. To retain nurse managers, nurse executive leaders should focus on three strategies: balance workload with support, invest in competency development, and promote work-life harmony. Nurse managers find greatest satisfaction in time dedicated to patient care, and they enjoy mentoring their teams. At a time when nurse turnover and vacancy rates are increasing, giving nurse managers time to nurture clinical nurses is critical. Yet the growth in nurse managers’ responsibilities leads to less time devoted to clinical work, reflecting a need to evaluate the scope of their responsibilities. Managing a clinical staff is only one part of nurse managers’ complex jobs. For example, implementing new organizational initiatives may be nurse managers’ responsibility. Rather than leaving them to singlehandedly implement new initiatives, perceptive nurse leaders are pausing to consider the support they’ll need. Support varies across organizations but can include assistant nurse managers, administrative assistants, or unit-specific nurse educators. Providing sufficient operational and administrative support can increase nurse manager job satisfaction and reduce turnover and vacancy rates. A common concern voiced by nurse managers is inadequate preparation and support as they transition to their new roles. The evidence suggests that nurse managers don’t feel “competent” until they have 5 years of experience. Organizations that implemented competency-based leadership development programs, such as the American Organization of Nurse Executives’ Nurse Manager Fellowship, reported accelerated competency development in nurse managers. Competency also can be developed through coaching. Many nurse managers want to be coached in decision-making rather than micromanaged by their directors. One organization developed nurse manager scorecards, which are detailed in the article by Krugman and Sanders, to guide coaching sessions between nurse managers and their directors. Successful use of the scorecard—or any other coaching tool— depends on the quality of the director–nurse manager relationship. Insomnia and stress are frequent complaints of nurse managers because of their 24-hour accountability for operations. They must be helped to disengage from work. Although nurse managers are accountable for clinical operations 24 hours a day, 365 days a year, they can’t be present and on standby every hour of every day. In most organizations, administrative supervisors are responsible for managing operations between 5:00 PM and 7:00 AM and on weekends. However, when problems occur on the unit, some clinical nurses reach out to the nurse manager, rather than the administrative supervisor, for guidance. This may be the result of a disconnect between the day shift, first-line nurse managers, and the administrative supervisors. Some administrative supervisors don’t view their role as managerial; instead, they see themselves as shift leaders focused on crisis management. Clinical nurses may detect these variations in management perspectives and call on nurse managers to intercede in disputes with administrative supervisors. 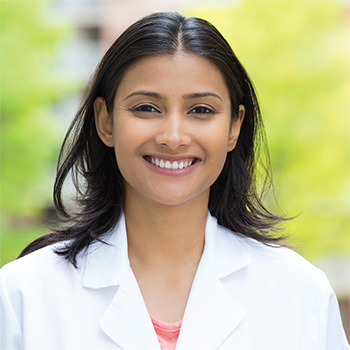 To counteract this disconnect, nurse leaders must promote strong relationships between nurse managers and administrative supervisors. Including administrative supervisors in nursing leadership team meetings will send a consistent message to the leadership team and clinical staff. Nurse managers are vital to organizational success. To achieve a smooth succession of unit-level leadership, the role must appeal to younger nurses willing to step up and assume managerial responsibility. Implementing evidence-based strategies to promote competence and work-life harmony will result in greater job satisfaction and retention of nurse managers. Nora E. Warshawsky is a professor in the University of Central Florida College of Nursing in Orlando. Krugman ME, Sanders CL. Implementing a nurse manager profile to improve unit performance. J Nurs Adm. 2016;46(6):345-51. Simpson BB, Dearmon V, Graves R. Mitigating the impact of nurse manager large spans of control. Nurs Adm Q. 2017;41(2):178-86. Warshawsky NE, Havens DS. Nurse manager job satisfaction and intent to leave. Nurs Econ.2014;32(1):32-9. Warshawsky NE, Lake SW, Brandford A. Nurse managers describe their practice environments. Nurs Adm Q. 2013;37(4):317-25. Warshawsky NE, Wiggins AT, Rayens MK. The influence of the practice environment on nurse managers’ job satisfaction and intent to leave. J Nurs Adm.2016;46(10):501-7.